If you love craft beer, then you know there’s a whole world of beer out there waiting to be discovered. The number of micro-breweries around the world is rapidly growing and these breweries are constantly developing new and innovative beers. This is what makes craft beer so great and why we’ve dedicated our lives to bringing the best beers from across the world to our members. Every month we travel to a new country to bring the back the best beers. So far, we’ve brought our members back beers from South Africa, Boston, Poland, Norway and the Balkans; meaning our members are constantly discovering new and often exclusive beers. These days supermarkets stock more than the standard range of big brand lagers and it’s now easy to pick up a few craft beers with your weekly shop. But the limited choice quickly becomes stale and you find yourself stuck in a drinking rut. 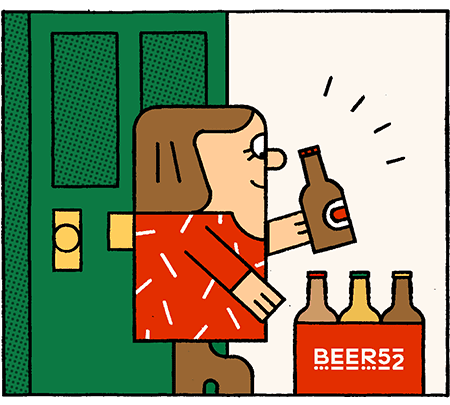 With Beer52, you constantly discover new beers with no effort required. It’s like beer Christmas every month! As the craft beer revolution grows, it’s becoming easier to pick up bigger brand breweries in the supermarket. But what about the exciting new and innovative micro-breweries? At Beer52 we’re making it our mission to support these microbreweries and help them reach a whole new audience of beer drinkers. Drinking great craft beer is only half of the experience. Inside your box every month, you’ll receive an issue of the award-winning Ferment magazine. Here you can learn more about the beers you’re drinking, the breweries behind them and more articles from the UK’s best beer writers including Matthew Curtis, Melissa Cole and Mark Dredge. As an added thank you, our members can earn taster points by rating and giving us feedback on their monthly boxes. These beers can then be used to buy more of their favourite beers or discover new beers from that month’s theme from our online shop. Ready to start your craft beer adventure?